In the fall of 2009, Simone fell ill, once again, with viral gastroenteritis and lost about 12% of her body weight (from 24lbs to 21lbs). Given she’s such a little peanut already, it was scary to see her lose more weight. Oh, and did I mention she’s a PICKY friggin’ eater…so it’s not exactly easy to bulk her back up again. 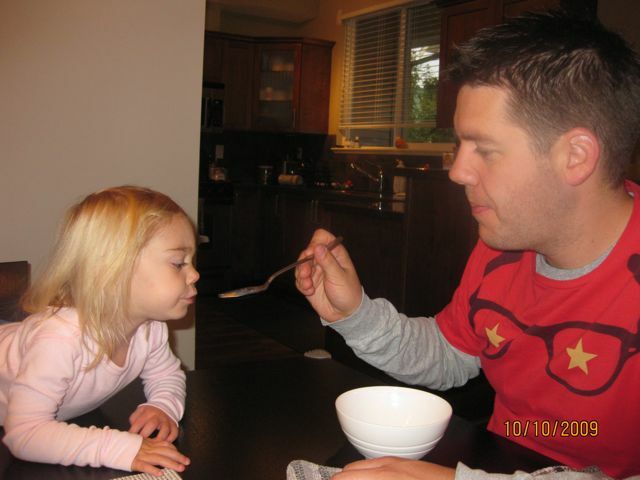 Once she was ready to eat again, we started making her oatmeal for breakfast. Well, praise the almighty Quaker, because she can eat, no joke, 1/3rd to 1/2 cup of uncooked oatmeal (it bloats when cooked, so trust me, that’s a lot). It’s quick and easy to do, and best of all customizable for your picky kid. -bring to boil, reduce temperature to low/med and stir, stir, stir. ← See…I told you it wasn’t poisonous. I made oatmeal pancakes this weekend. Simply pancakes with huge heap of dry oatmeal added. They were a big hit. Especially with jam. Clever! I'm going to try that, Simone loves pancakes. Thanks for the tip.